On the way to school, three burnt-down warehouses by the sea are being reconstructed. 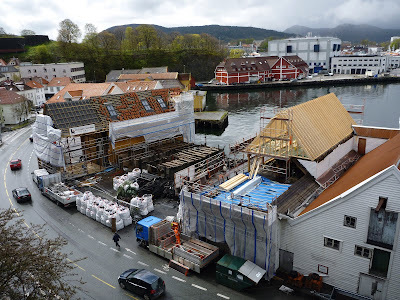 It's quite fascinating to follow process, where the buildings are in different stages of being rebuilt. They also raise some questions: Are artisan methods being used? Should they be? What should the buildings look like? One of last year's diploma student suggested they be constructed to echo the shapes of the original buildings, but nor the materials and methods of construction. It appears to me that they're now partly using newer forms of construction and materials, such as a steel frame and doors made from MDF or something similar, whereas the façades will be copies of the ones who were there before the fire. I guess it has something to do with wanting to tell the history of the place through the architecture, but the fire is also a part of that history. However, the old façades were nice to look at and were very familiar to the people who live in and pass through this area, like the faces of old friends. Maybe they'll be happy to see them back, in a year or so?